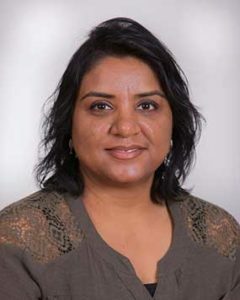 Pinki Patel, PA is a nationally certified Physician Assistant, licensed to practice in state of Florida. Pinki graduated with a Physician Assistant degree from Touro College of Bayshore, New York in 2003, and started her career as a PA in the fast-paced environment of Emergency Department of Brookhaven Memorial Hospital in Patchogue, NY. She moved to the Jacksonville area in 2005 and joined AOTC (Arthritis and Osteoporosis Treatment Center). Her years of experience at AOTC and commitment to the practice and her patients makes her a top-notch health care provider and an integral part of the day-to-day operations of this facility.